PALMER — The number of farms in Alaska is rising as the state warms up. But climate change isn't necessarily behind the boom. Instead, Alaska's warming trend is accompanied by increasingly unpredictable weather that can make growing crops here even trickier than it already is. Pete Mayo and his wife, Lynn, grow carrots and other northern stalwarts at Spinach Creek Farm northwest of Fairbanks. Both spring and fall come later than they used to, said Mayo, who's farmed for more than 20 years. This season, Spinach Creek produced about half the carrots of a peak year — 8 tons — because a chilly spring delayed planting, among other factors. Without a hard frost even into late September, the kale, cabbage and kohlrabi still in the fields aren't growing anymore. "The changing climate hasn't made it easier," he said. "We can say that for sure." There are more farms in the Last Frontier now than there were a decade ago. Alaska had 750 farms in 2015 compared with 700 in 2008, according to the USDA National Agricultural Statistics Service. The total farm acreage dropped slightly. The state's farming history is rooted in large-scale — many of them failed — government agriculture projects aimed at supporting big commercial dairies, hay farms or farm colonies in the Matanuska Valley, Point MacKenzie or Delta Junction. State officials say Alaska's new, smaller farm boom is due to the rise of the farmers markets popping up around the state, the booming popularity of Community Supported Agriculture boxes that supply locally grown produce every week to individual customers and niche crops like peonies. 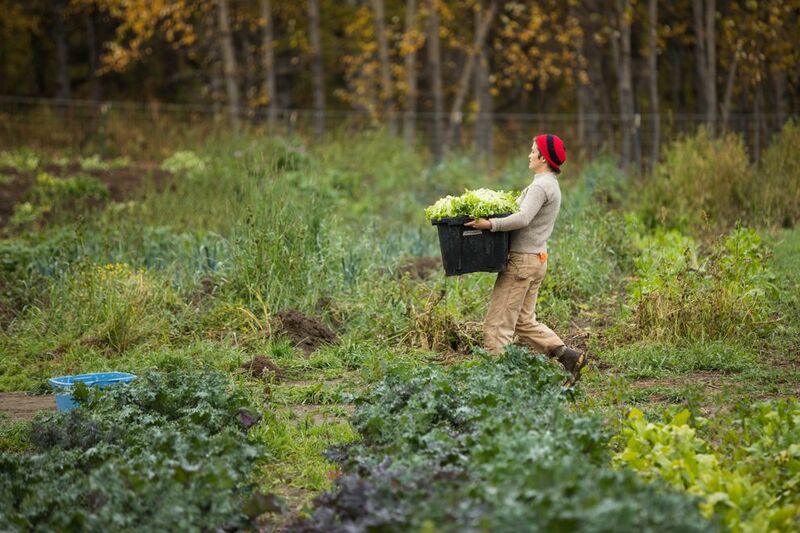 Alaska growers, particularly on the Kenai Peninsula, also jumped on a federal program subsidizing the cost of high-tunnel gardens that can grow warmer-weather crops in small, protected spaces. And yes, the weather is warmer too. Alaska's average mean annual temperature is nearly 4 degrees higher now than it was in 1949, according to the Alaska Climate Research Center. Mean annual temperature average increases range from 1.6 degrees in Kodiak to 6.3 degrees in Barrow. Temperatures are up "especially clearly" since the late 1980s and early 1990s, said Jeremy Littell, lead research scientist with U.S. Geological Survey Alaska Climate Science Center. The past few hot summers led to new Alaska State Fair records for heat-loving vegetables like cucumbers — at 20 pounds, the banana-yellow club more than doubled the old mark — and even one for a 7-pound tomato. Farmers like Ben VanderWeele in Palmer are even growing wheat. APU Spring Creek farm manager Megan Talley mentioned an Anchorage farmer trying to grow watermelons outside, and friends in Chickaloon with a 10-year-old in-ground cold storage system that no longer stays cool enough through the summer. Talley describes the oats that found a foothold on her farm near Palmer and the farm's safe planting date in mid-May instead of the more traditional early June. Then again, the farm manager in her fourth season said, this summer reminded her of "the unpredictability of it all." "The first three summers I was here I think I was tricked into thinking we had these sunny, bright warm summers," she said. "And then this summer has been really rainy and cool and damp." That tracks with climate data over time that shows sharp peaks and valleys from year to year. Those erratic swings are indicative of the variability that accompanies climate change, researchers say. Diminishing sea ice and increasing sea surface temperatures over most of the North Pacific Ocean "are going to create patterns of variability we didn't used to see as often," Littell said. "As we move into the future, you get a scenario where even though the average temperature is going up, there's still that variability where some years are good, some years are bad," he said. "If you sank all your money into growing apricots or apples, some variety that isn't well adapted here, and then you lose the flowers two out of three years, you may not make your money back for a while." Farmer Sarah Bean, who opened Arctic Organics in Butte with her husband in 1989, says the new vagaries of climate come with hard lessons. During an earlier warm spell, the farm tried to grow fennel, a dicey proposition in cool summers like this one. Then again, these frost-free Septembers take some of the misery out of farming too. "It's very erratic. You have to be ready for anything," Bean said. "Right now I wouldn't move my orange orchard here."